I had been obsessed with the Instructables eggless mug brownie for a few weeks, but with two tablespoons of oil in each serving, I just had to break up with it. After seeing a recipe for 2-Ingredient Pumpkin Brownies on Cookies & Cups, I wondered if maybe I could shave some calories off the Instructables brownie by using pumpkin instead of oil. I found that I couldn’t stray too far from the original if I wanted this to work out. So I didn’t. 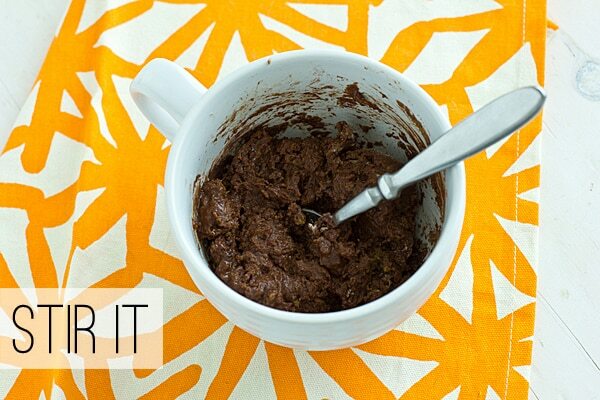 There are still 4 tablespoons of flour in this pumpkin mug brownie and 4 tablespoons of sugar. This may be vegan and oil-free, but it’s not healthy! It’s healthier. Without all the oil, it’s a little bit less rich than the original. But the richness is replaced with pumpkiny-ness. (Sure that’s a word! Sure it is!) And if that’s not good enough for you, well, I threw in some dark chocolate chips. Alright, let’s make a delicious pumpkin mug brownie! I’ve used both vanilla soymilk and unflavored Silk coconut milk in this recipe, with good results. Combine all the ingredients in a latte mug. If you don’t have a latte mug, use a small bowl. 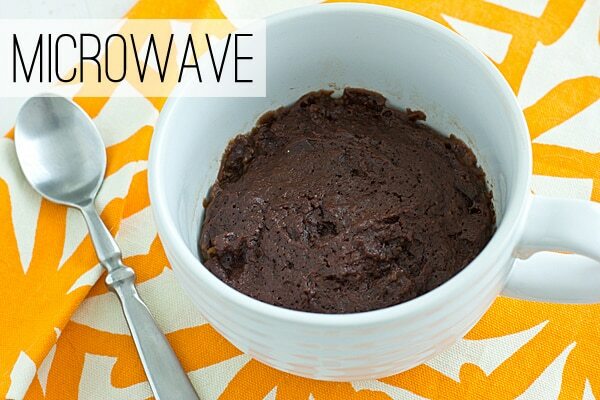 Unlike traditional mug cakes, this one doesn’t rise very much, so it won’t make a mess in the microwave. Stir the ingredients together. It will be thick, but be persistent and stir until everything is combined. …ice cream and more pumpkin pie spice! That’s better, right? 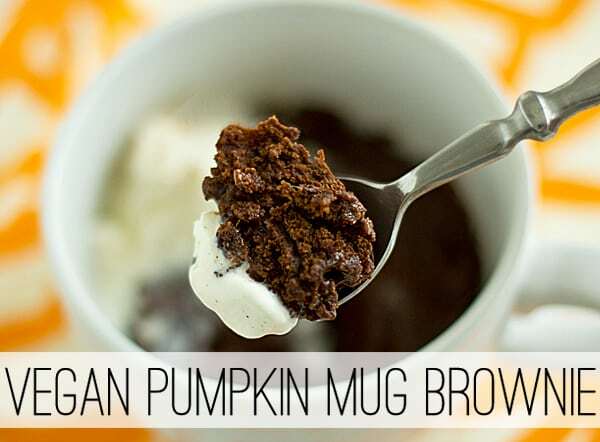 This pumpkin mug brownie is best shared. It’s pretty decadent, y’all. If you don’t share it, you’ll probably regret it in a few minutes. Believe me, I speak from experience. If you want a printable version of this recipe, it’s below! This vegan mug brownie replaces the oil with pumpkin. With a little added pumpkin pie spice, it’s perfect for fall! Stir together all ingredients in a latte mug or small bowl. Microwave for 1 minute; continue to microwave at 15 second intervals until top of brownie is dry. Top with ice cream if desired. Eating this right now–so good!! Yay, I’m so glad you like it! I hope you like it! I made it again last night. Chris isn’t usually a fan of the whole mug dessert thing, but he loves this one too. Instant gratification, who doesn’t love that! It doesn’t get much better than this! yum, yum! Okay, brilliant. I think I need to come up with a low carb pumpkin mug brownie (mine will inevitably include butter, though). Because I want. Bad. I haven’t done these in the oven, so I can’t say for sure. I can’t see any reason why it wouldn’t work, though. I’d try baking at 350 degrees and cook for maybe 8-15 minutes (watching closely, of course!). I tried a mug cake once but I didn’t really like the texture. I’ll have to give them another shot because I still like the idea of them, especially a pumpkin version! This one sounds like a decadent dessert and would be great with the ice cream on top…I’m not a big fan of brownies though, so if you come up with a non-chocolate version, I’d give that a try! This one definitely has a different texture too, although I think it’s more from the fact that it uses pumpkin instead of oil! I was actually thinking of giving it a try without the cocoa. Maybe it would be like pumpkin cake? Sounds good to me – I would take pumpkin cake over chocolate cake any day! Wow, nice graphics, and color and text coordinated with the photos, very pro! I have to admit I haven’t tried the whole microwave baking thing, and probably won’t until I get a microwave that rotates the food properly– everything’s a little dicey with it until then. But I have had the experience you describe of trying to get a baked good just a little more healthy and then having to back off. I was sort of infamous in the family for that– only took me about a decade’s worth of meh birthday cakes to learn when to try to make it healthier and when to just go with it. Thank you! I am more of a cook than a baker, so I have difficulty making baked goods healthier too. With cooking, you can operate more on instinct, so I’m comfortable with that. Baking requires precision! I have to say, the healthier brownie did taste good, but the texture was strange and the appearance was even worse! Must . . . stay . . . away. Any brownie that can be microwaved and ready to eat in a flash is just bad news for me and my goal to keep fitting in my pants. Tempting, though! And the addition of pumpkin is intriguing. Yeah, it’s definitely dangerous. Pretty much the only thing that keeps me eating brownies everyday is laziness. But now that I can microwave them? Game-changer. And not in a good way. 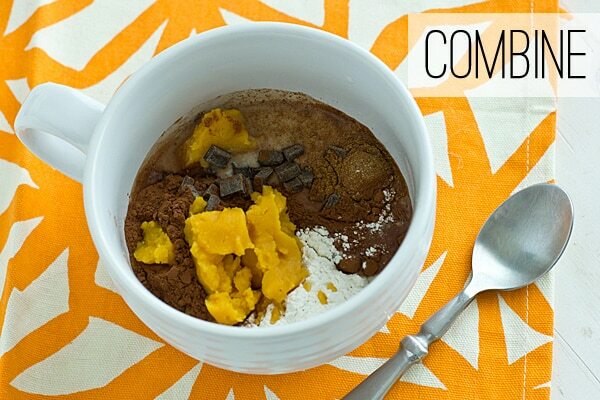 This looks so simple and I never would have thought to pair pumpkin and chocolate! Trying this as soon as I buy some chocolate. I usually avoid keeping the stuff on hand because I don’t handle temptation very well. Yeah, I have to do that too. I have a bad day and eat a handful of chocolate chips from the pantry. I have terrible coping skills. Terrible! OMG, YUUUUUM!!! I want this NOW!!! BTW, I love all the new things you’re adding to your site and how you present the instructions. Eye-catching and FANTASTIC. Thank you! I’m trying to post tutorials and informational things on Tuesdays now. People seem to really like them and it’s a nice change of pace from the recipe posts! This was really good! I left out the cocoa powder. Next time I’ll use less sugar. Maybe 2 tbsp agave nectar instead of 4 tbsp sugar. I’m glad you enjoyed it! Without the cocoa powder (which is a little bit bitter unsweetened), I definitely think that you could get away with less sugar. This looks wonderful! I love mug cakes/brownies. I think it’s probably impossible to make a truly healthy one but this looks perfect to me! I think next time instead of pumpkin/(spice) I’ll try it with coconut oil (still very healthy) and coconut flakes just for a fun variation !!! I love the idea of using coconut oil! I’ve also heard from people who have used mashed banana and applesauce instead of the pumpkin, with good results. I’m sorry, I don’t have a calorie count, though. But it’s definitely not a low cal dessert! This was so good! Instead of 4 T of sugar, I used 2 T of agave nectar. This makes it a bit healthier without sacrificing much sweetness. Also, the agave nectar added a nice hint of molasses. I made this and wrote about it here. It was super good! I really love mug cakes, particularly ones that don’t call for eggs. I’m playing around with the recipe to make a lower sugar version, and one with white chocolate instead of cocoa powder. This has become my go to version of a mug cake. Thank you so much for sharing the recipe! I think that my microwave is a rebel! I made everything as instructed, put it in a microvawe for 1,5 minute, looked – still not dry. One more time to the microvawe for 1 minute – bottom burned, top stil wet! No idea what went wrong? Any ideas? 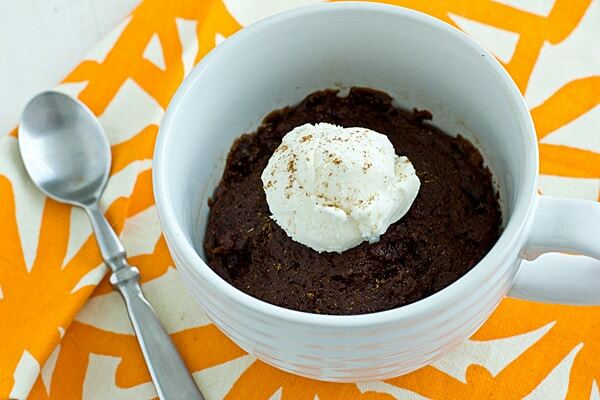 With a mug cake like this, it cooks so quickly that microwaving it for an additional minute was probably to much. Next time, microwave it in 15 second increments after the first minute and a half until it’s dry on top. I’ve been on the hunt for cute ceramic measuring spoons – where did you get yours? They’re adorable! They were on clearance at Anthropologie last year, so I’m afraid they probably don’t sell them anymore! Can I substitute the sugar with agave nectar? I have no idea – I haven’t made it like that! 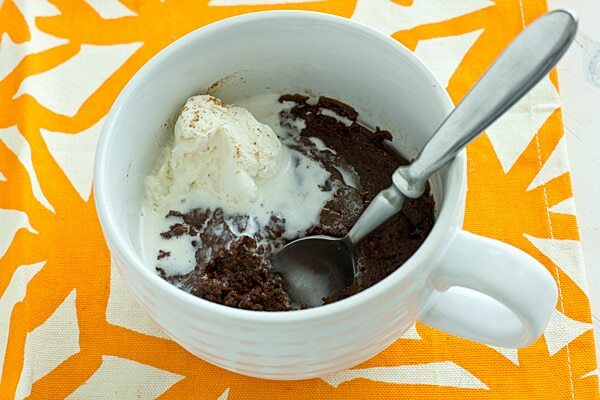 I love microwave mug brownies. They’re so easy when I want something sweet but don’t have anything on hand. Sometimes you just have to bite the bullet and use full fat and sugar…when you try to make it too healthy, it’s just not a brownie any more! Everything in moderation.